Oheka Castle Wedding Photos show the venue’s dramatic elegance, in the style of old world Europe. Oheka was built on Long Island's Gold Coast in 1919 and it has been a hub of celebration and entertainment ever since. The building came to life when financier and patron of the arts, Otto Hermann Kahn, commissioned celebrated architects to design his ideal country residence. He wanted it to be a place of where art could be admired and discussed, and for it to be a location where he could host lavish parties. The result was a magnificent estate, surrounded by colorful gardens. Today, couples are able to celebrate at Oheka, just as Otto Kahn once did during the decadent era of the Roaring Twenties. The setting provided by the grand estate and the grounds around the venue make for exquisite Oheka Castle Wedding Photos. 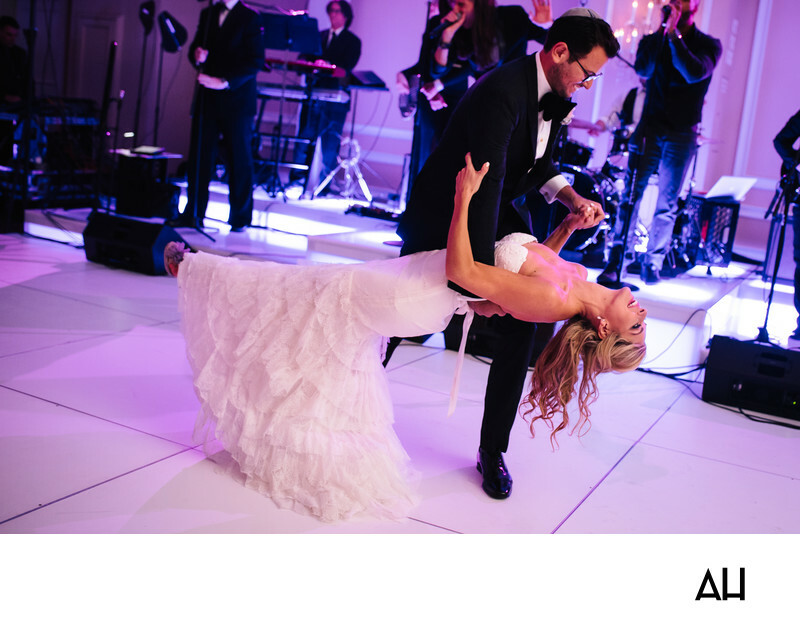 In this photo, the bride and groom are seen dancing the night away. They are caught up in the moment, enjoying the celebrations as the band plays in the background. The groom dips the bride back, gazing down admiringly at his wife. The bride looks carefree and at home in his arms. She is radiant in a mermaid style wedding dress, ending in lace ruffles. As the groom tips her back, her feet peep out from beneath the ruffled skirt, exposing bright pink shoes that would make Otto Kahn proud. It is a classic image of a couple enjoying their moment, and the company of the one they love, to the very fullest.